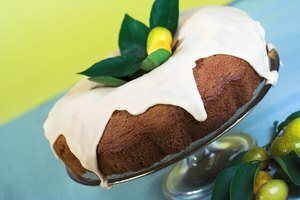 A sponge cake is a foam cake without added butter, shortening or oil. These light and airy cakes are leavened by whipping air into the eggs in the recipe. The delicate foam structure of sponge cakes is prone to deflating before the cake is fully baked or after emerging from the oven. 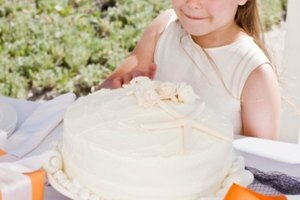 Avoid this by taking some precautionary measures during the mixing and baking of the cake. Help the eggs hold more air by warming them before beating them for the cake. Whisk the egg whites and 2 tbsp. of sugar from the cake recipe in the top of a double boiler over simmering water. Keep the egg whites and sugar moving as you heat the eggs to prevent cooking them. Use the warmed egg whites and sugar as directed to use the egg whites in your recipe. Instead of beating the eggs whole, separate the whites from the yolks. Beat the egg yolks with the sugar for up to five minutes or until the beaten mixture falls from the whisk in thick ribbons. Vigorously beat the egg whites in a separate, metal container without any fat or egg yolks in the whites. Fats will prevent the egg whites from properly beating. Carefully fold the beaten egg yolks in thirds into the beaten egg whites. Incorporating small amounts of the egg yolks keeps the egg whites from deflating and the cake from falling. Do not use an electric mixer to fold the ingredients together; opt for a spatula or large whisk instead. Bring the spatula under the base of the egg whites to lift the whites over the added egg yolks. Expect some streaks in the folded mixture. Use cake or pastry flour instead of all-purpose flour. The cake flour has a lighter texture and will not weigh down the cake. Sift the dry ingredients to keep the cake light and fluffy and to avoid collapse. If your recipe is an American sponge cake using baking powder, use only the amount listed in the recipe and do not be tempted to add more. Flavoring extracts should only be added after beating the eggs to ensure the eggs get enough air incorporated into them. Do not grease a large pan for baking your sponge cake. The ungreased sides allow the low-fat cake to cling to the sides, helping it to maintain its risen size in the oven. 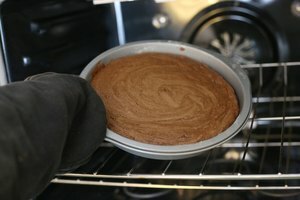 Use a tube pan with a removable bottom to bake the cake. Look for these as tube pans or angel food cake pans. 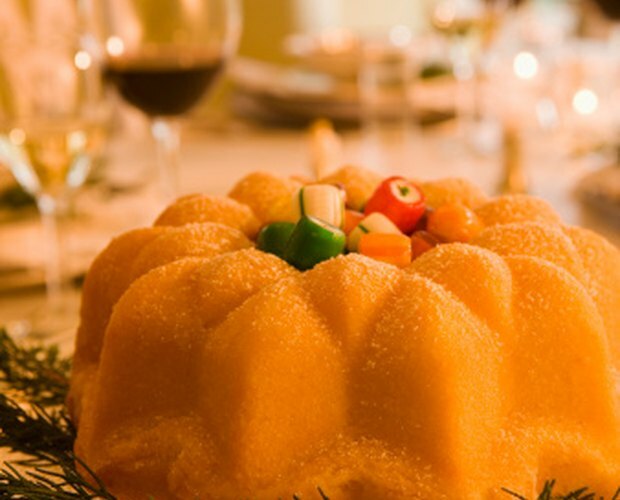 The center tube conducts heat to the middle of the cake, cooking the cake throughout. An unevenly heated cake is likely to fall. For making roll cakes, such as jelly rolls or Swiss rolls, use a shallow jelly roll pan. The 1-inch depth ensures the entire cake bakes through. Grease only the bottom of a jelly roll pan or line it with parchment paper for easier releasing of the sponge cake.